Do you want a TV in your bedroom? You may have heard that you are not ‘supposed’ to have a TV in the bedroom, as it can get in the way of romance, your sleeping pattern, etc. That may be true. What is also true is that people do what feels comfortable and natural to them. And that each person’s bedroom is their own private space that should have their own unique touch. Bottom line: having a TV in your bedroom is based on personal preference. And let’s be honest, the bedroom has become a space that is not just used for sleeping. Relaxing and unwinding after a stressful day can be done just as effectively in the bedroom as, for example, in the living room. And if your relaxation method includes relaxing on top of (or under) the covers while getting lost in a Hollywood story (not everybody can be dedicated bookworms), then so be it. But even if you take that leap and bring a TV into your room, what are the necessary considerations in terms of placement and viewing quality? Elegance doesn’t need to go out the window once electronics enter the room. 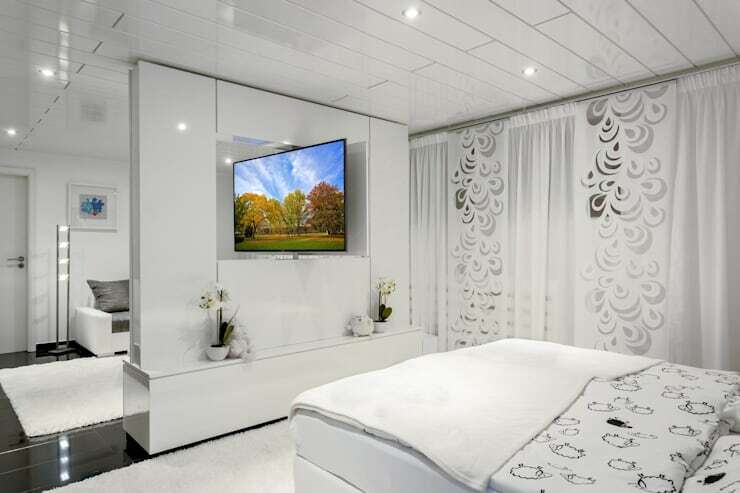 A flat-screen television can be mounted to your bedroom wall without detracting from any of the other visual highlights, such as your bedroom artwork, classic furnishings, or that stunning wallpaper. 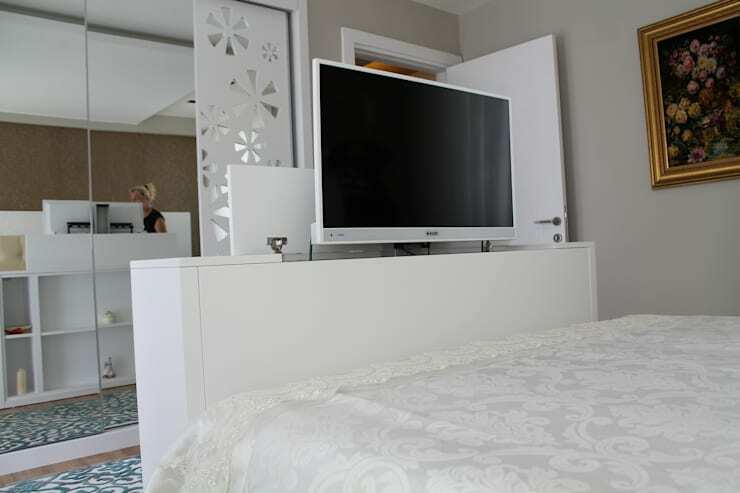 Mounting a TV can be a quick and easy task for your bedroom designing. First identify the wall you want to employ for your television. Then make sure the television gets a direct view from your bed and, if possible, overall view from every corner of the room. Avoid mounting your television in the corner space or at a nook area, as it may interrupt smooth viewing of television from every angle of the room. homify hint: The mounting of your television must be as close to eye level as possible, so obviously this will depend on your bed’s height. But in general, it is best to avoid mounting a television under 1,5 m from the floor. There are times (like TV series marathons or the Oscars) when you want your television front and centre – and if that happens to be while you’re snuggling in bed, even better. So, how about a built-in TV? You've probably seen them on shows about the rich and famous, but these devices have become quite popular. A pop-up TV literally rises out of the foot of the bed and can be concealed when not in use. There are also lifts available which automatically fold, slide, and store the TV underneath the bed at the touch of a button. Both provide perfect viewing angles, but they typically require a flat-panel for effective storage. 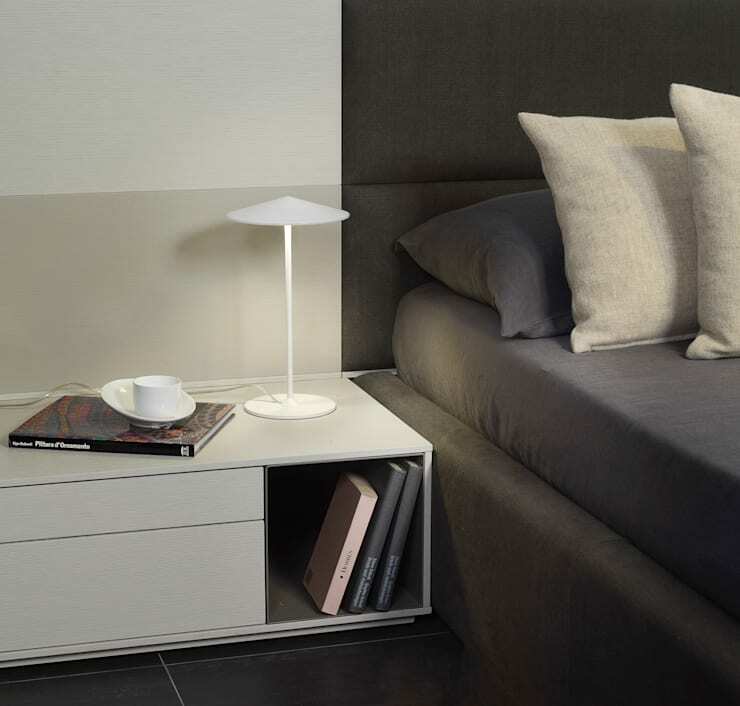 Or if that is a bit out of your price range, you can always opt for a normal side table (or small bookcase) in front of your bed, with your flat-screen friend placed securely on top. Are you an action addict? Thrilled about thrillers? Or crazy about comedy? Regardless of your movie genre preference, few things beat lying safely and comfy in bed while watching your favourite movie displayed from above. So, if you’re out of wall space, your bedroom ceiling is another option for mounting that TV – and you're not limited to extending it downward with a ceiling or arm extension mount. TV ceiling mounts allow for optimal viewing of flat-screen televisions at comfortable angles. There are hundreds of ceiling mounts on the market to consider. Each mount has different features, like cable management and varying degrees of tilt and swivel, and some mounts are even capable of holding dual back-to-back screens. So, for the ultimate in reclined viewing comfort, hit your local home department store and select a mount that fastens that TV most comfortably against the ceiling. Whatever size television you incorporate into your bedroom, comfort should still be your number one priority. A television – and its accompanying cabinetry – should be as unobtrusive as possible. Vintage pieces of furniture, like your grandmother’s armoire, can be re-imagined as media storage. Yes, it may have housed select pieces of clothing a long time ago, but with the addition of a few shelves, it can find a new purpose as a sweet home for your TV and DVD collection. If you can't find the perfect cupboard or closet to support your flat-screen friend, consider hiring a carpenter to build something that perfectly fits your TV's proportions. homify hint: Avoid placing your TV in front of a window, or opposite a west-facing window. Glare or the difference in light from the windows and your screen can cause eye strain. Yes, we know we’ve stated that eye level is the best position for your television. But these days you can easily buy a swivel mount to tilt that TV down for easier viewing. And even if you don’t want additional mechanisms to clutter up your fireplace-meets-television zone, then by all means, do what makes you feel comfortable. However, if you're dreaming of watching your favourite romance movie on top of your fireplace (especially when curled up warmly under the covers), then make sure that TV is nicely integrated into the design of your bedroom. 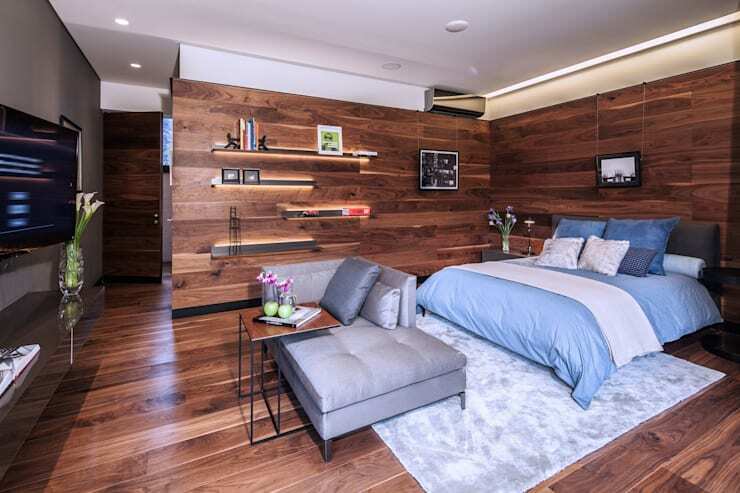 Your bedroom fireplace plays a big part (dare we say it could be your room’s second focal point? ), so bottom line regarding TVs on top of the fireplace: it can be done, but make sure to do it well. Ensure the design of your fireplace and room accommodates that new TV, and it won’t become an eyesore. 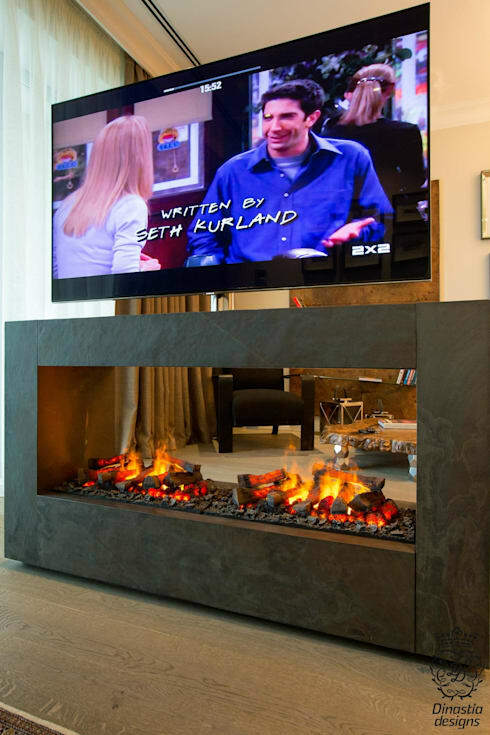 Speaking of getting hot, be sure to view our: Hot fireplaces for the modern house. When watching TV, a lot of us prefer total darkness. Although that is ideal for a movie theatre, it can cause some eye-strain in the bedroom. Plus, when darkness descends, your body immediately readies itself for sleep, yet by forcing yourself to stay awake and watch TV, you can damage your sleeping pattern. Therefore, always have a bit of light when you watch television. Have a lamp nearby to create a low glow in the room. Install one on each side of the bed so that both you and your partner have complete access to it. Additionally, you can clamp a reading lamp on your headboard to provide a little illumination around your eyes to avoid straining them (and this also works wonderfully when reading in bed). Or, install a dimmer in order to control the level of light (this particular installation also creates an opportunity to spark some romantic mood-lighting when necessary). 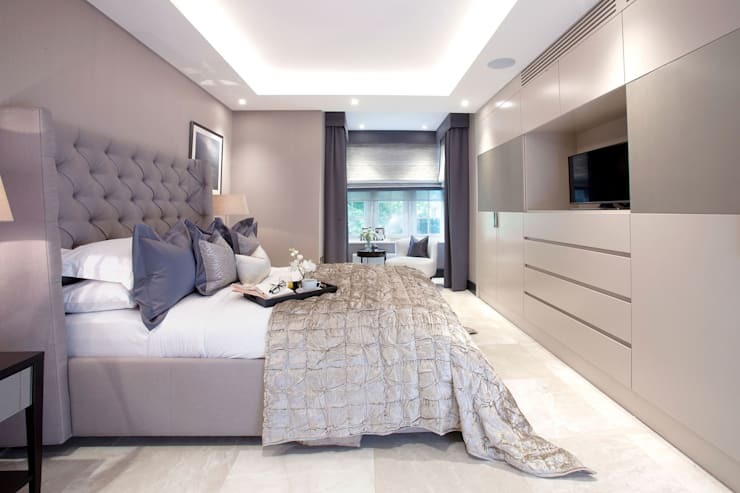 homify hint: Bedroom a bit small? Rethink that TV then. Focus on the necessary furniture first (your bed, closet, dresser, mirror, etc.) and don’t buy new furniture until you’ve arranged the pieces you already have and need.